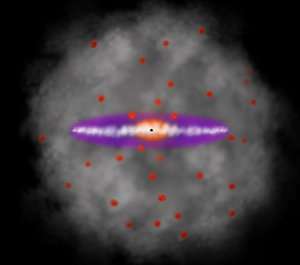 An image of dark matter surrounding the Milky Way. This artist's impression shows the Milky Way galaxy. The blue halo of material surrounding the galaxy indicates the expected distribution of the mysterious dark matter, which was first introduced by astronomers to explain the rotation properties of the galaxy and is now also an essential ingredient in current theories of the formation and evolution of galaxies. New measurements show that the amount of dark matter in a large region around the Sun is far smaller than predicted and have indicated that there is no significant dark matter at all in our neighbourhood. Simulation of the evolution of the theorized dark matter halo around the Milky Way galaxy from the galaxy's formation to today.